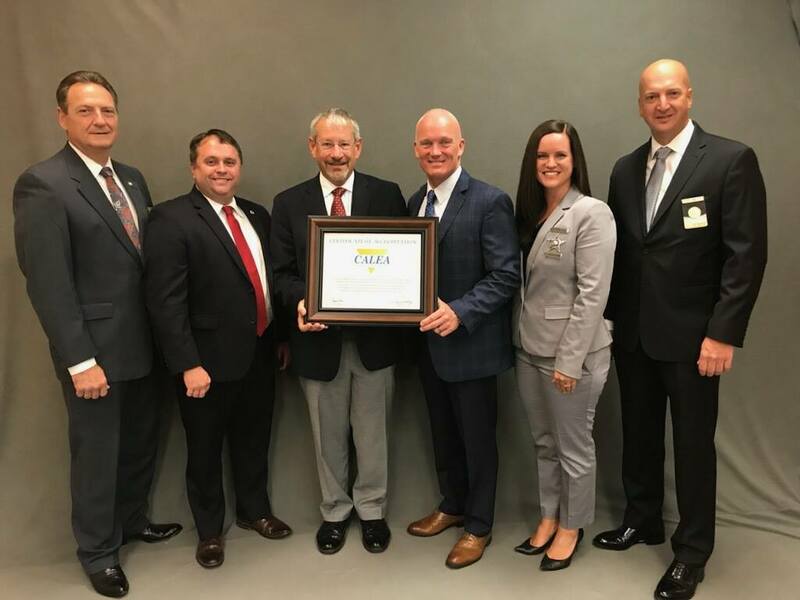 The Brunswick County Sheriff’s Office was awarded national accreditation on July 28, 2018 by the Commission on Accreditation for Law Enforcement Agencies, Inc. (CALEA). BCSO is one of only six Sheriff’s Offices in the state of North Carolina to receive this award. Following a multi-year self-assessment phase and a meticulous site-based assessment of community engagement, policy, procedures, equipment and facilities by CALEA assessors, Sheriff John W. Ingram, V, Accreditation Manager Elizabeth Bynum, Captain Mose Highsmith and Brunswick County Commissioner Frank Williams attended the CALEA conference in Grand Rapids, Michigan. Each agency being reviewed, goes before CALEA’s 21-member Board of Commissioners where the commission reviews all findings and determines the agencies’ accreditation status. It has been a lengthy, and at times challenging process, but to be recognized on a national level for our commitment to excellence in public safety, and more importantly, our commitment to service to the community, is truly humbling. The exceptional feedback that we received from the assessors in regards to how the Sheriff’s Office conducts business and serves the community made me very proud. I can’t say enough about the hard work and dedication of the men and women of the BCSO. This award most certainly would not have been possible without their efforts and commitment. The evening of the hearing, during the celebration banquet, CALEA President Richard Myers and Executive Director Craig Hartley awarded BCSO with accreditation, signifying excellence in public safety and commitment to community. This is BCSO’s first award of national accreditation. The BCSO now moves into CALEA’s four-year Accreditation cycle that includes four annual remote, web-based file reviews and a site-based assessment in the fourth year. 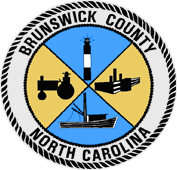 Brunswick County residents should be proud of the fact that Sheriff Ingram and the entire Brunswick County Sheriff’s Office have reached a level of excellence that has earned them a highly coveted accreditation achieved by only a small percentage of law enforcement agencies across the country. Congratulations on this well-deserved recognition! Controlled Liability Insurance Costs – Accredited status makes it easier for agencies to purchase liability insurance; allows agencies to increase the limit of their insurance coverage more easily; and, in many cases, results in lower premiums. Stronger Defense Against Lawsuits and Citizen Complaints – Accredited agencies are better able to defend themselves against lawsuits and citizen complaints. Many agencies report a decline in legal actions against them once they become accredited. Greater Accountability Within the Agency – Accreditation standards give the Chief Executive Officer a proven management system of written directives, sound training, clearly defined lines of authority, and routine reports that support decision making and resource allocation. Staunch Support from Government Officials – Accreditation provides objective evidence of an agency’s commitment to excellence in leadership, resource management, and service-delivery. Thus, government officials are more confident in the agency’s ability to operate efficiently and meet community needs. Increases Community Advocacy – Accreditation embodies the precepts of community-oriented policing. It creates a forum in which police and citizens work together to prevent and control crime. This partnership helps citizens understand the challenges confronting law enforcement and gives law enforcement clear direction about community expectations. Improved Employee Morale – Accreditation is a coveted award that symbolizes professionalism, excellence, and competence. It requires written directives and training to inform employees about policies and practices; facilities and equipment to ensure employee safety; and processes to safeguard employee rights. Employees take pride in their agency, knowing it represents the very best in public safety. The Commission on Accreditation for Law Enforcement Agencies, Inc., (CALEA®) was created in 1979 as a credentialing authority through the joint efforts of law enforcement’s major executive associations: International Association of Chiefs of Police (IACP); National Organization of Black Law Enforcement Executives (NOBLE); National Sheriffs’ Association (NSA); and the Police Executive Research Forum (PERF).The purpose of CALEA’s Accreditation Programs is to improve the delivery of public safety services, primarily by: maintaining a body of standards, developed by public safety practitioners, covering a wide range of up-to-date public safety initiatives; establishing and administering an accreditation process; and recognizing professional excellence. The purpose of the commission is to develop standards based on international best practices in public safety, and to establish and administer the accreditation process. The accreditation process is how a public safety agency voluntarily demonstrates how it meets professionally recognized criteria for excellence in management and service delivery. Specifically, CALEA’s goals are to: Strengthen crime prevention and control capabilities; Formalize essential management procedures; Establish fair and nondiscriminatory personnel practices; Improve service delivery; Solidify inter-agency cooperation and coordination; and Increase community and staff confidence in the agency. This accreditation program provides public safety agencies an opportunity to voluntarily demonstrate that they meet an established set of professional standards based on industry best practices and approved by an all-volunteer board of commissioners.